1. ARP poisoning: ARP poisoning is necessary to make the network traffic between Victim machine and Gateway to pass through your system. The ARP poisoning can be done either through Manual or Automated approach. Automated ARP poisoning can performed with tools like Ettercap, cain and abel (available only for windows) etc. 2. Sniff the network: Sniffing is necessary to get the valid cookie. My favorite tool for sniffing is Wireshark (earlier called as Ethereal) which is a packet capturing tool. 2.a) Start Wireshark and capturing the traffic and the Cookie can be easily find out using "http.cookie" filter. As shown in screenshot one can see the mail traffic from the corresponding system. 3. Get the valid cookie: Gmail uses "GX" as a cookie value to authenticate. After capturing the traffic through Wireshark filter out GX cookie value. 3.a) Right click on the "GET" request and click on "Follow TCP stream" to get GX cookie. Copy the GX value alone without semicolon to use it to replay. 4. Replay the cookie: Create a new cookie in your browser with same GX value (Replay). 4.a) For constructing the cookie, the firefox plugin "Add N Edit Cookies" is required. The plugin will look like this. 5. You are in victims Gmail session: Successful replay of GX should take you to the victim's Gmail Session. After saving the cookie, type mail.google.com/mail in address bar of the browser and press enter the you should be able to view the victim's Inbox. Thanx for viewing it and let me know the comments or clarifications if any. 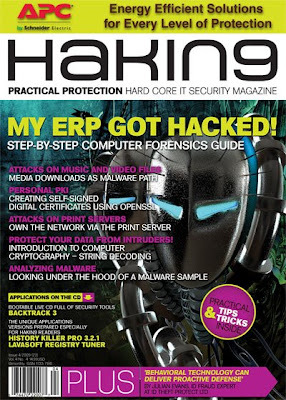 Haking9 is a magazine which gives u an exact brief of all latest information security related news. Please click on below image to checkout more about the current issue. For more information click on the above mentioned url.